A comfortable, value for money and a lightweight Alloy bicycle for commutes and leisure rides. Hero is one of the largest manufacturers of bicycles in India with a large fleet of bicycle models. 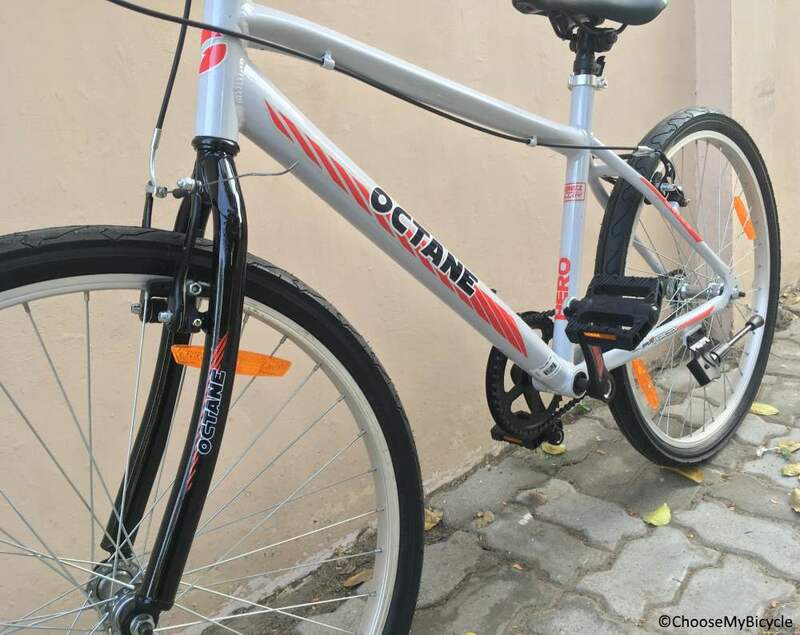 Hero’s Octane series of bicycles are premium in looks and are built for performance with different models for varied usages. We got the opportunity to test ride the Hero Octane Parkour 26T and here is what we thought. 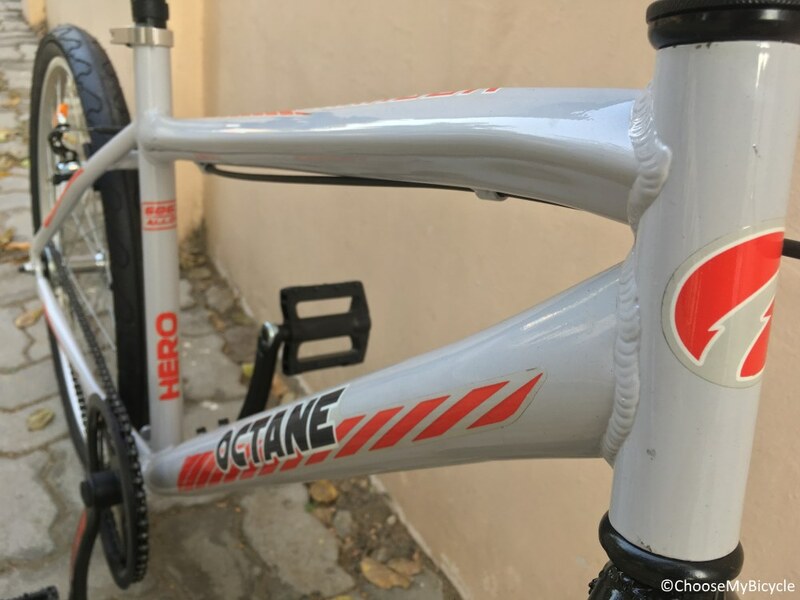 The Hero Octane Parkour 26T is built around a full Alloy frame. The geometry is sleek with thin tubes which kept the weight in check. The strength of the frame was felt during the test ride when riding over bumpy roads, thanks to the strongly welded tubes especially where the bottom tube and top tube meet at the head tube. The head set was lengthy and makes the handlebar higher for a straight back riding posture. The rigid fork is sleek and could withstand certain amount of vibrations of the surface. This city bicycle which I test rode came in a Light Grey frame colour with Red and Black as secondary colours for the text and graphics. The gloss finish paint job was neatly done. The full Black rigid fork was of good contrast to the lighter shade of grey on the frame. This budget Alloy bicycle comes with a Single-Speed drivetrain. The 18T freewheel at the rear along with a 44T crankset powers this single speed bicycle. During the test ride, the pedaling on flat surfaces and on slight elevations were smooth and wasn’t hard to pedal. This Single Speed is perfect for short commutes on flat surfaces in the city and more importantly easy and economical to maintain. A pair of Sprandum branded V-brakes handled the braking on the Parkour 26T. These brakes were powerful enough to bring the bicycle to a sudden halt and also felt balanced during the test ride on slightly patchy urban roads. The brake levers were easy to use. The Steel 600mm handlebar comes with a minimal raise in the middle and padded palm grips which decreased the vibration transfer to the hand from the surface. The Hero Octane Parkour 26T rolls on a pair of DSI 26” x 1.95”sleek tires. These tires definitely contributed towards the easy and fast acceleration of this bicycle. These tires did lack some grip with its different tread pattern. That being said, during the test ride on dry roads these tires were balanced and safe when braking hard. The Spur Saddle had the ideal width and length to keep the rider comfortable on bumpy and long rides. This urban bicycle was comfortable to ride with a straight back posture, thanks to the lengthy head set which made the handlebar higher. The sleek frame tubes and 26” x 1.95” sleek tires made the ride fast and easy to accelerate. The conventional V-brakes made sure the braking experience was safe and balanced. 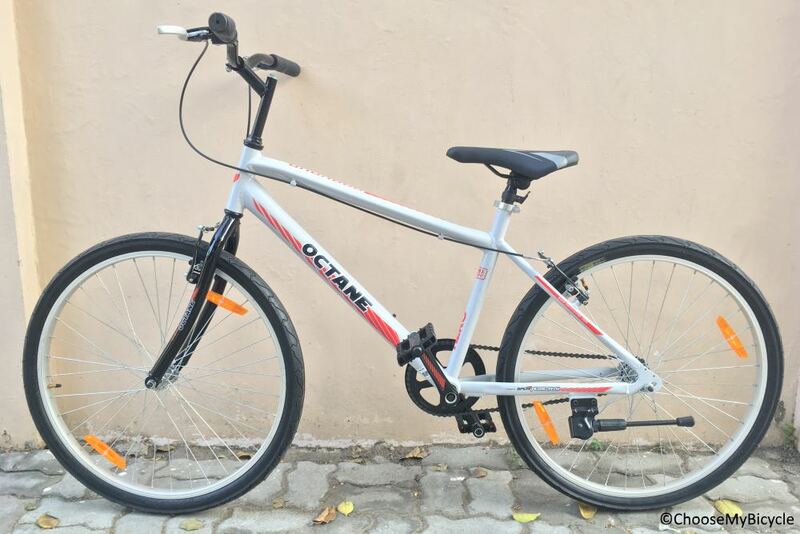 Priced at Rs.8,899 (as on 11th April 2019) post discount on a MRP of Rs.10,999, the Hero Octane Parkour 26T is an ideal bicycle for urban commuting and for short leisure rides.